Cynthia: Date: June, 2017. Subject: Origins Game Fair. Known in the United States, at least, as Gen Con’s quiet but friendly little sibling who lives in Columbus, Ohio. Also known for revealing major summer releases well in advance of Gen Con. But what really goes on at Origins? Shut Up & Sit Down was curious, so I donned my best black hoodie and infiltrated the scene. 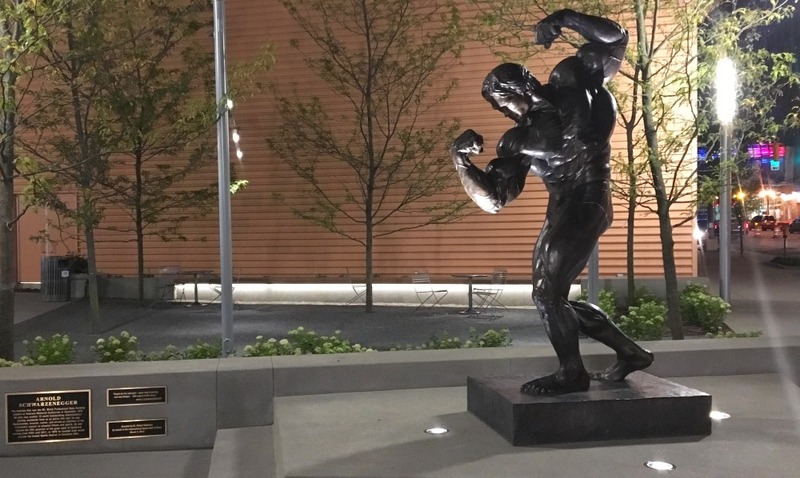 Slipping past the bronze statue of Arnold Schwarzenegger that guards the convention center, I entered a bustling space filled with thousands of gamers. Fortunately I seemed to blend in, and… oh, alright. It was just a great con. Locals and industry people were open and nice, it was easy to get into events or find gaming space at the last minute and, above all, the Columbus Convention Center is a quick walk from the North Market, where there’s all kinds of good, nutritious food like Vietnamese noodle bowls and donuts and gourmet ice cream. My mission was twofold: become more familiar with the role-playing scene to help our regular RPG reviews, and discover the best new board game releases. Right away, Brotherwise Games’ upcoming release Unearth stood out like a peacock in a parking lot. It’s easy to become lost in the soft colors and Monument Valley-style ruins depicted on Unearth’s cards. It’s just as easy to become caught up in rolling dice to “excavate” these ruins and trying to claim them before your opponents. Which of the alluring pastel cards should you place your die on? A large set of the same color will get you the most points, but at the same time, you don’t want to put all your eggs in one excavation. And which of your five glittering dice should you use? Is this ruin truly worthy of your eight-sided die? 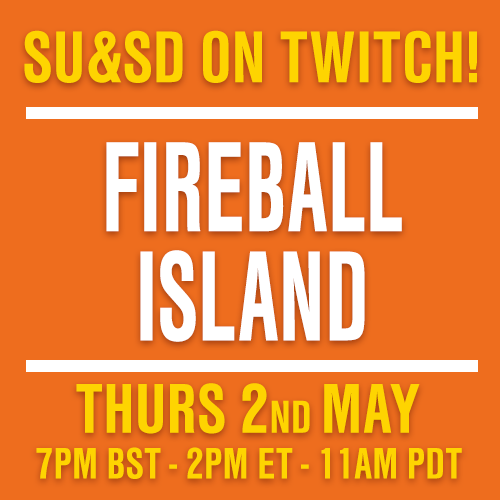 Could a six-sided die win the card this round, or will Someone Else profit from your poor luck? No ruin can be excavated with just one die, so you might piggyback off of your competitors’ digs, or your dice might help someone else to claim the ruin. Don’t worry, though, Unearth graciously rewards all your efforts. When your dice help earn excavate a ruin for someone else, you’re recompensed with delver cards that let you bend the local archeological regulations a little. Low dice rolls let you gather candy-like hexagonal “stones” that can be fitted together into Wonders for side points. With such a strong combination of head-clenching decisions and balancing touches, I think that, even without the absurdly pretty components, I would still find Unearth irresistible. Sidereal Confluence, however, was something I’d heard of before seeing, otherwise it would never have caught my eye. 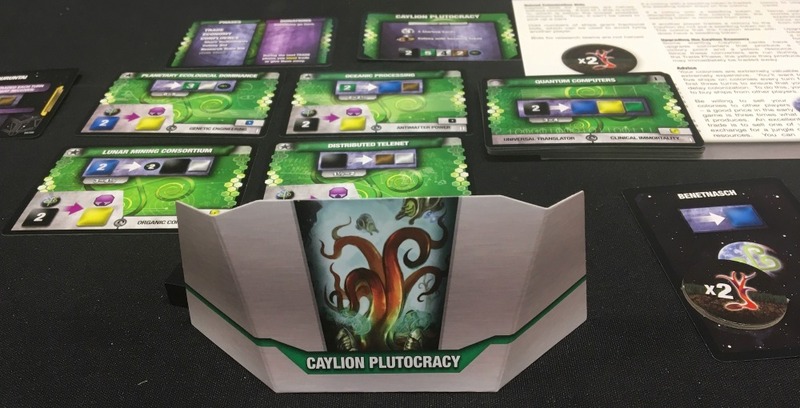 Reports were coming in such as “new designer,” and “worked on it for years,” but also “space negotiation game,” and “hours long,” so I was dreading some sort of watered-down Twilight Imperium clone. THANK GOD this game is not that. Sidereal Confluence, despite the fact that its name reminds me of con flu, is a good board game. 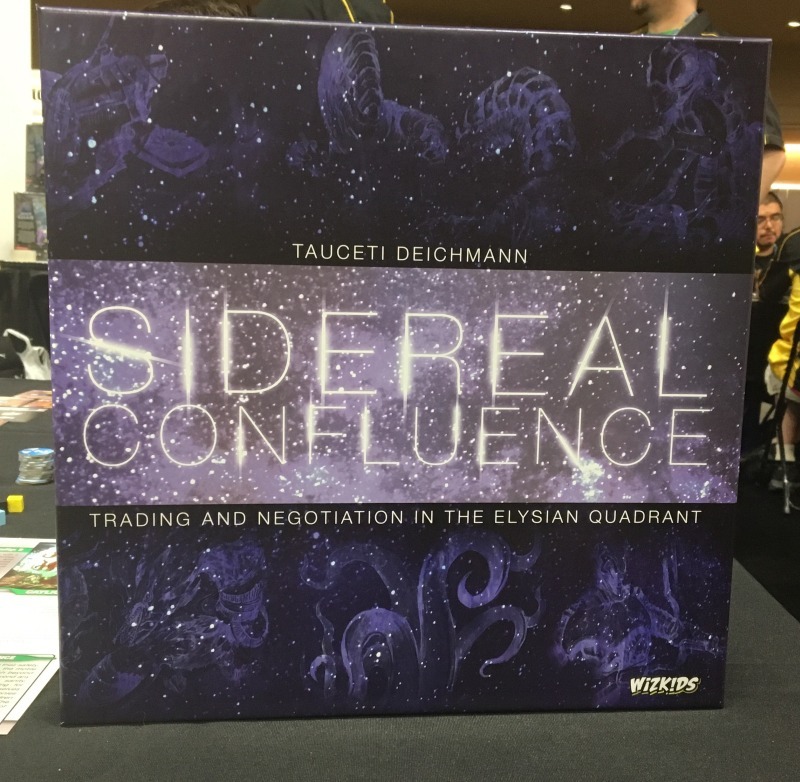 Designed by one Tauceti Deichmann, Sidereal Confluence combines German-style engine-building with Ferengi-style negotiation. Your goal is to make your species the Steve Jobs or Hedy Lamarr of space by inventing clever new technologies. It turns out, weirdly enough, that inventing things takes research and funding(? ), so you need to have a pretty solid resource-generating engine to do it. Once you do invent Quantum Computers or Clinical Immortality, you get the points, but everyone gets access to the new tech, with the result that no one’s infrastructure is ever dramatically disadvantaged. No, hold on, let’s back up. 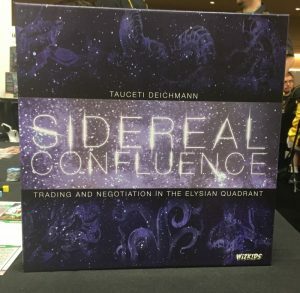 Sidereal Confluence really is all about trade and negotiation. No species, whether tentacular, robotic, or insectoid, can make their economy work without bargaining for ships or bartering away colonies. Your success depends on figuring out the going rate is for a sky-blue cube of biotech or a black cube of pure information (and ideally, slightly undercutting it). Only after all the deals are done can you generate resources and get down to the technological research you’ve longed to do all along. 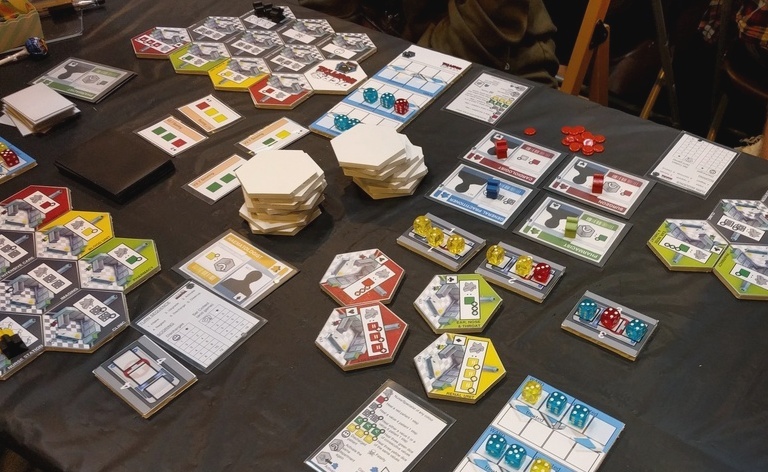 A game of Sidereal Confluence starts out like a yard sale with free lemonade and gradually becomes a hectic and ruthless stock market trading floor. And it handles up to nine players, which would be unthinkable if the game didn’t go surprisingly fast and feature a lot of simultaneous action. As it is, I’m very eager to turn someone’s living room into an interstellar stock exchange as soon as I get the chance. 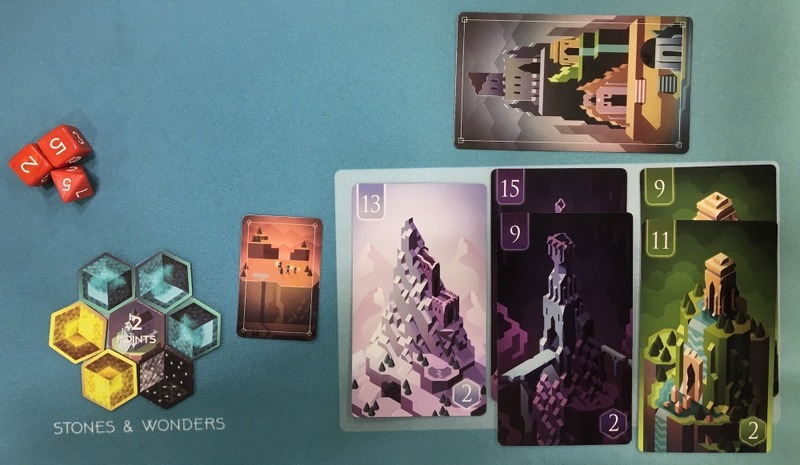 Not long after trading away all my cubes in Sidereal Confluence, I walked into another sort of strange confluence known as Games on Demand. 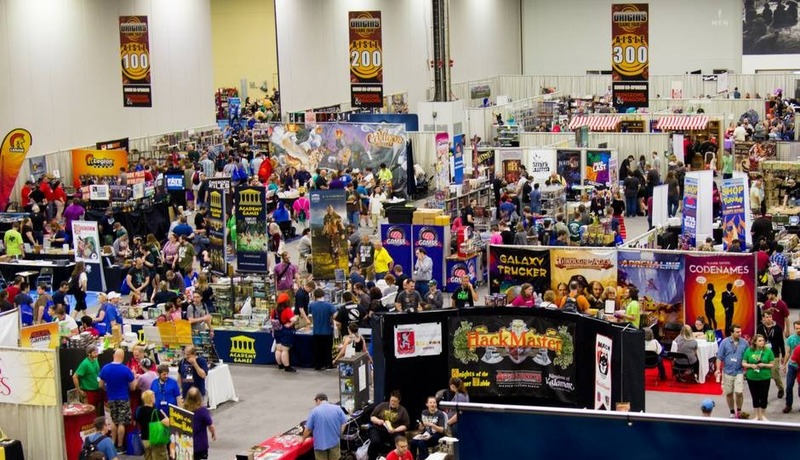 This indie RPG event was designed as an alternative to normal RPG con sessions, in which you play a pre-generated character in a pre-written con scenario of a “major studio” RPG like Pathfinder or Edge of the Empire. Games on Demand is somewhat like speed-dating for RPGs (she wrote, never having speed-dated). You walk up with a couple of generics and end up playing something you’d never have found otherwise. What you play is determined partially by luck: each session starts with a lottery, and when your letter (B is for Basilisk, L is for Lich) is called, you claim an open slot in one of the twelve or so different RPGs about to be played. Every time I participated I played something I hadn’t before and, most importantly, Had a Good Time. 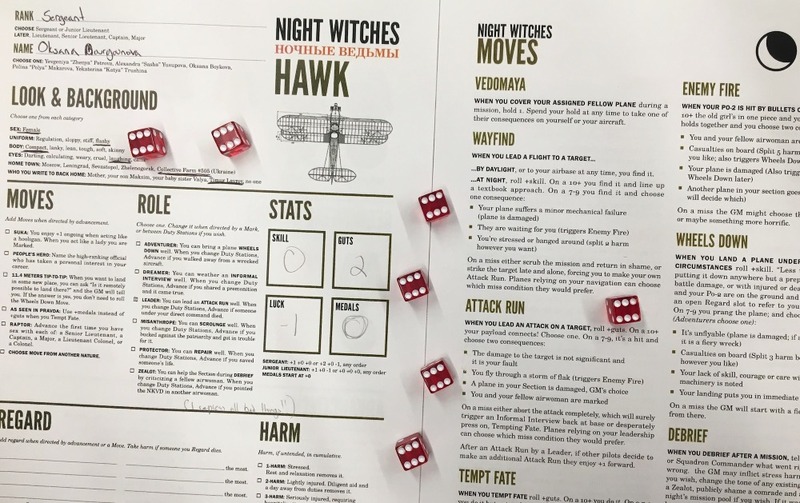 My first RPG date was with Bully Pulpit’s Night Witches, an amazingly well-structured game about women in the Russian air force during WWII. Full of historical details and really uncomfortable high-stakes situations, it reminded me of Orange Is the New Black in all the best ways. Probably, probably, we’ll take a closer look at Night Witches later this year. But it was a different upcoming game by Bully Pulpit that shook me up even more. 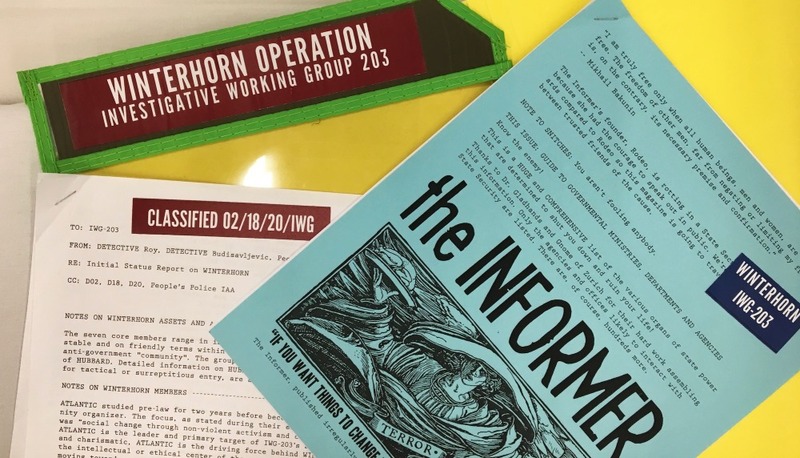 Winterhorn is a card-driven RPG (comparable to some of Bully Pulpit’s LARPs) in which you play a member of a state security force tasked with taking down an activist (or terrorist?) cell. It plays over a series of rounds in which you and your “colleagues” choose tactics to use against the activists: police intimidation? Infiltration? Violence? All three? The fate of the activist cell and what exactly you know about it are both determined by which tactics you pick. Jason Morningstar told me he designed Winterhorn to teach real-life activists about the tactics used by modern oppressive regimes. I took away form the game not only a knowledge of those tactics, but also a horrific understanding of how casually corporate these state agencies can be. We talked about birthday parties and favorite pubs as we decided to ruin people’s lives. And yet, underneath our jokes and bravado was an undercurrent of fear. What if one wrong word or the wrong attitude could mean not just getting fired, but getting interrogated, or relocated to a prison camp? In a working group full of spies, how can you tell who is really spying on whom? It’s very likely that Winterhorn will be one of the offerings at Gen Con’s Games on Demand. If you can’t catch it there, you’ll be able to apprehend the game upon its release in November. I eventually tore myself away from Games on Demand to investigate the new edition of RuneQuest, an RPG that was huge during the 1980s and that Quinns excitedly told me is the backdrop to video game King of Dragon Pass. What drew me to RuneQuest was exactly this setting: Glorantha is a sprawling world of bronze-age battles and matriarchies and cults and gods who walk among mortals and monsters. It’s Homeric Greece and Celtic Britain and early dynastic China. In my demo I got to play a cranky, stabby Wonder Woman who rode a war bison, and few things could be better than that. 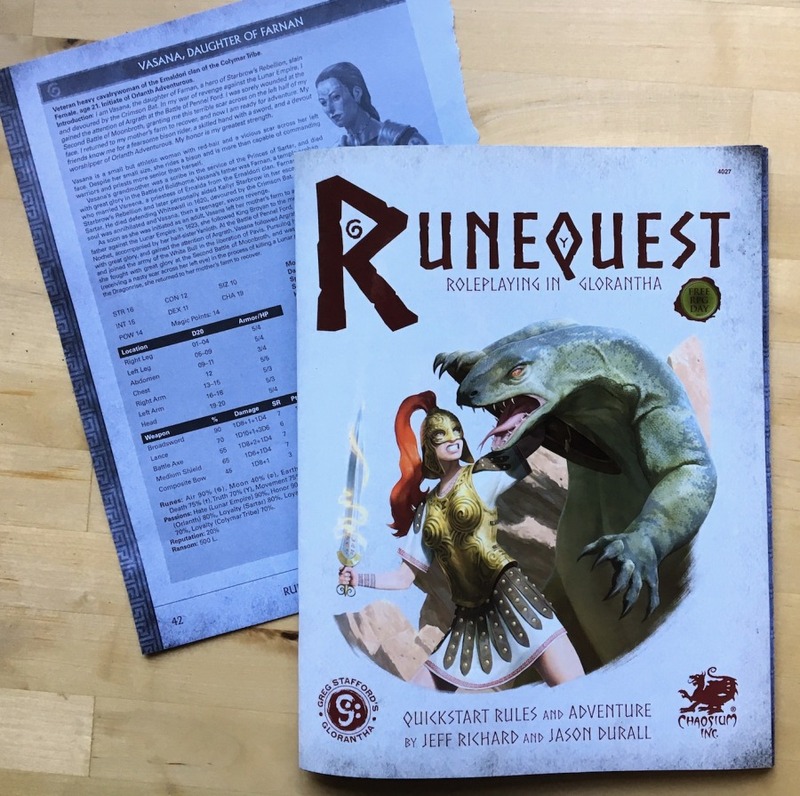 If you’ve played Dungeons & Dragons, the percentile dice system of RuneQuest is easy to pick up, and Chaosium has been streamlining it as much as possible. The combat rules are particularly neat, and I want to show them to everyone I know who’s ever wielded bladed weapons. Physical harm and armor are broken up by body part: an attacker has to say what part they’re aiming at, because it matters that your torso is covered in armor but your shapely, suntanned arms aren’t. Similarly, your combat ability varies depending on your weapon: you may be great with a spear but terrible with a broadsword. This makes for a more complicated character sheet, but it also makes for vivid, interesting, and more realistic combat scenes. RuneQuest should probably not be anyone’s first RPG. But if epic adventures and vast settings and war bison are your jam, and you’re comfortable with how these RPG thingies work, go for it. 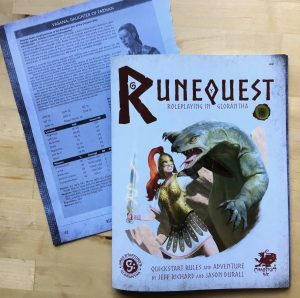 You’ll be able to download the RuneQuest quick-start guide for free starting on July 1, with the core rulebook coming out Feb 2018. Meanwhile, my surveillance apparatus had been picking up lots of traffic around the mysterious words Lisboa and Seikatsu. What could it all mean? I discovered that Lisboa is an expansive and impossibly gorgeous game about rebuilding Lisbon after a devastating 1755 earthquake. 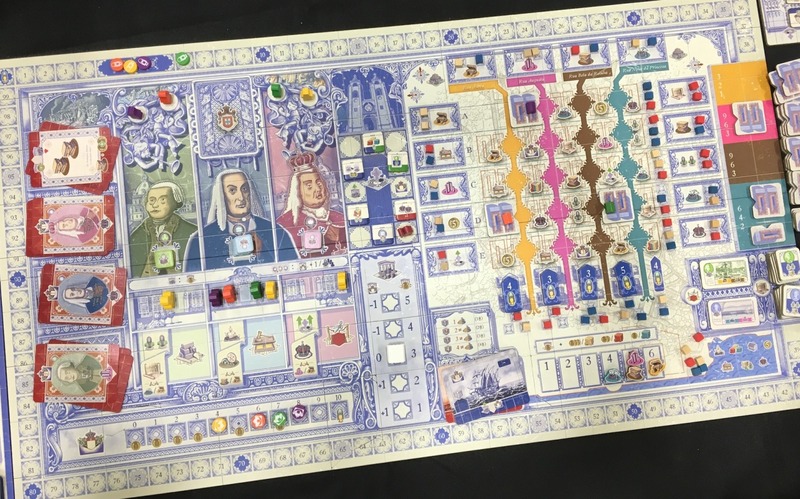 Players were saying things like “even better than The Gallerist” and designer Vital Lacerda kept modestly saying, with big, sincere eyes, “It’s about my home.” After watching some gameplay, I dashed off with a review copy as if it were the Holy Grail (TBH Lisboa is probably heavier). 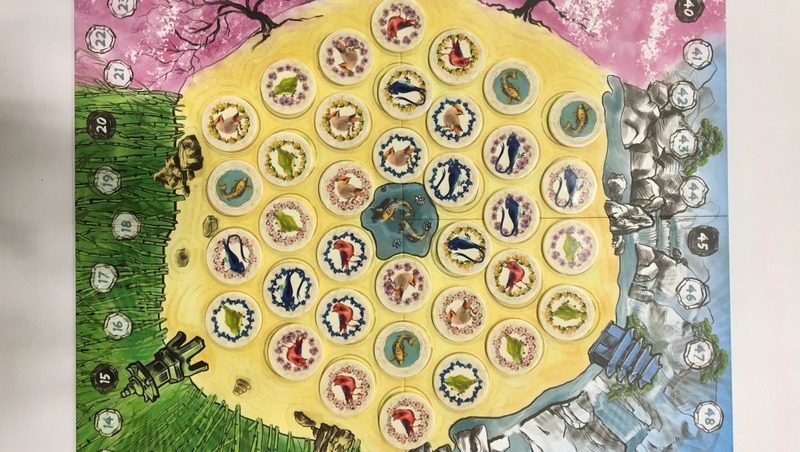 Seikatsu is a charming tile-laying game governed by elegant, perspective-based mechanics vaguely akin to those of Tash-Kalar, but also adorned with birds and flowers that seem lifted from your grandmother’s china. 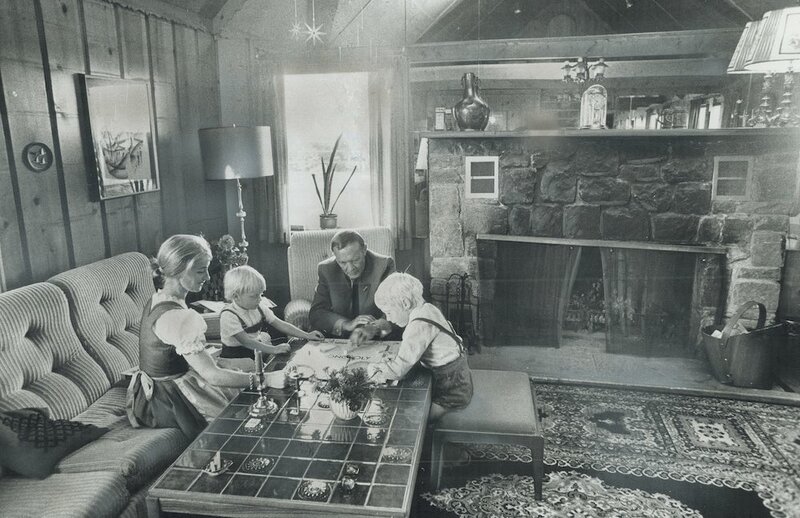 It’s the sort of game you might leave on your table to attract unsuspecting potential players, or turn to for a calming half-hour break in the middle of a hectic day. Or enjoy while sipping coffee with your partner on a weekend morning. I think it may, possibly, become a classic(!). By the last day of the con there was one game on my radar that I hadn’t tried and had heard suspiciously little about. At first glance, it was, in fact, suspiciously little: a compact box, small decks of cards, and a board no larger than my laptop. I thought there had to be more than met the eye, and I was oh so right. If this con had an invaluable, well-kept, top-level tabletop secret, that secret was most certainly Pit Crew. Take the frenzied, real-time, piecemeal spaceship construction of Galaxy Trucker and make it simpler. And about cars instead of spaceships. Now, make that thing into a team game, so that you have to coherently communicate with someone while you’re both scrambling for parts. Add in a little bit of dice rolling, throw a wrench into the engine block, and you’ve got Pit Crew. It’s fast. It’s frustrating. It’s ridiculous. It’s glorious. In Pit Crew, each team (or person, in a three-player game) takes custody of a race car. Your goal is to refuel the car, change its tires, and do any needed repairs by playing your numbered cards in the right order VERY FAST. Go too slow and another team gets an insurmountable lead. Make a mistake and your wheel falls off, or your car breaks down on the racetrack. But know this: you will. make. mistakes. You’ll somehow think that the number after 8 is 5, or you’ll play three cards when you need four, or you’ll somehow completely neglect to refuel. And the horror of discovering you’ve made those mistakes is fantastic. It makes you scream and moan and bite your fist and hug your team in laughing commiseration, and want to do it again and again. 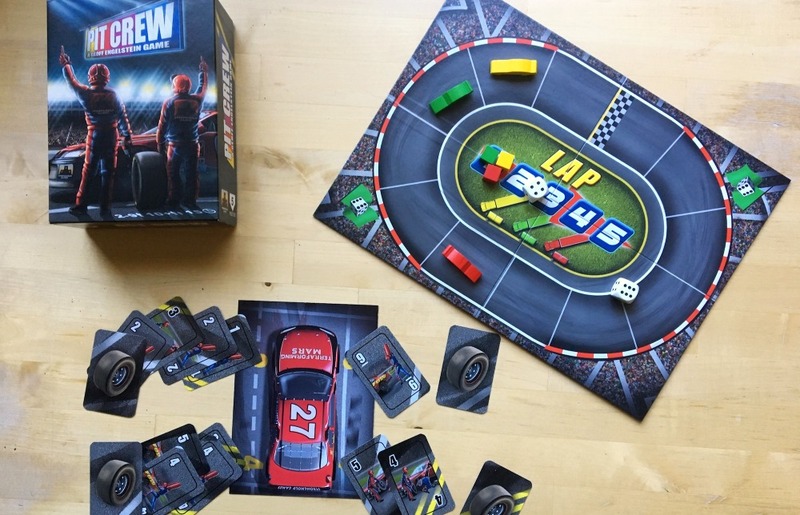 Pit Crew is so portable and accessible that you’ll want to take it everywhere with you. The pub. The airport. Work. The actual race track. Weddings. Baby Showers. You get the idea. It’s dangerous! This is how Stronghold Games is going to subjugate us all. With one copy of Pit Crew in every backpack, winning our hearts and corrupting our minds until we willingly become their card-wielding, imaginary-car-repairing agents of tabletop subversion. We’re all doomed. Marvellously. I left Origins with a duffle bag full of review copies and with my cover as a Shut Up & Sit Down spy completely blown, but it was totally worth it. Now for a few weeks of laying low, playing games, and slowly making my way to our safe house up in Canada. Use this intel as you see fit – I gathered it for just for you.